TOUR COMMENCES FROM :19TH SEPTEMBER 2017 TILL – 27TH SEPTEMBER 2018. 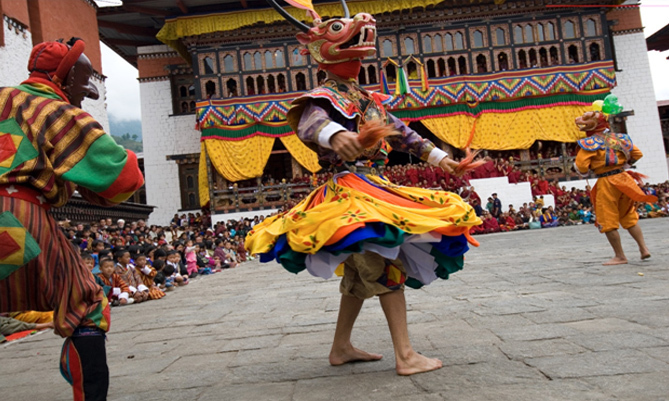 Destination Covered : Thimphu - Punakha – Gangtey - Paro. Distance -55 Km, Time required : Approximately 1 and half hour drive. Evevation at Thimphu : 2334mts. Fly to Paro, Bhutan, on Druk Air, the National airline of Bhutan. If you get a seat on the left side of the plane and the weather cooperates, you may have spectacular views of the high peaks of the eastern Himalaya, including Cho Oyu, Everest, Lhotse, Makalu, and Kanchenjunga—five of the highest peaks in the world—as well as peaks in Bhutan such as Jhomolhari, JichuDrakye, and Tsering Kang. After visa formalities at the Paro airport, your guide will meet you and drive you into town for lunch. Afterward, later drive to Thimphu,On the way visit Simtokha Dzong. 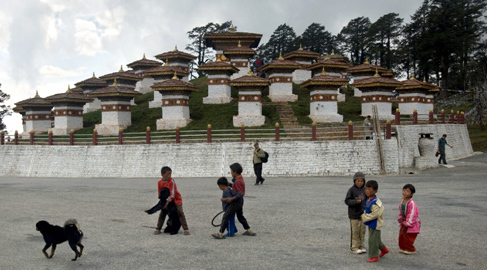 This is the first ever fort to be built in Bhutan the capital of Bhutan. It is believed to have been built over the demoness that is buried beneath the fort where it now stands. It was built in the year 1629 by the Shabdrung Ngawang Namgyel. Later drive to Thimphu which is just 10 minutes drive from here. On arrival check in at the hotel. The rest of the day is at leisure to unwind and absorb the beauty of this isolated kingdom. Lunch and Dinner at the hotel. Overnight at the Hotel. Today , following breakfast at the hotel , you will enjoy a full day guided tour of the capital city. The morning tour includes a visit to National Library, which houses an extensive collection of Buddhist literature,with some works dating back several hundred years. 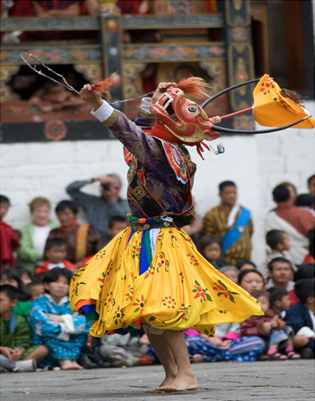 Visit the nearby Institute for Zorig Chusum (commonly known as the Painting School),where a Six-year training course is given in the 13 Traditional Arts and Crafts of Bhutan. Drive back to the town to have a good lunch at one of the restaurant designated by Bhutan Inbound. After lunch proceed to your next sightseeing points. It includes a visit to Kuensel Phodrang, called as Buddha Point, where you will be visiting the World's tallest sitting Buddha Statue. Next visit is to the National Memorial Chorten. The building of this landmark was originally envisaged by Bhutan's third king, His Majesty Jigme Dorji Wangchuck ( "the father of modern Bhutan")who wanted to erect a monument in honour of world peace and prosperity. Completed in 1974 after his untimely death, monument, serves both as a memorial to the Late King and as a monument to peace. Later in the evening visit the Fort (TashiChhoeDzong) or the fortress of the Glorious Religion, the beautiful medieval fortress which houses most of the Government's office and King's Throne room. It Is also the summer residence of Je Khenpo, the Chief Abbot. Distance -84 km, Time required : Around 2 Hrs and 30 minutes. Following breakfast at the hotel, drive up to Dochula Pass(3,088m/ 10,130 ft) stopping briefly here to take in the view and admire the chorten, mani wall, and prayer flags which decorate the highest point on the road. If skies are clear, the following peaks can be seen form this pass ( left to right) : Masagang(7,158m), Tsendagang(6,960m),Terigang(7,060m),Jejegangphugang(7,158m),Kangphugang(7,170m),Zongphugang(7,060m),a table mountain that dominates the isolated region of Lunana - finally Gangkar Puensum,the highest peak in Bhutan at 7,497m. Later proceed for sightseeing, It includes the hike to the famous " Chimi Lhankhang "called as “TEMPLE OF FERTILITY”. The hike is mild and it takes you through the valley of Sopsokha and its beautiful terraced paddy fields before reaching the spot. Later on your way back have lunch at the cafeteria . Spend about an hour before proceeding to Punakha. On arrival at Punakha check in at the hotel.Later visit to Punakha Dzong, the 17th century fortress which has played important role in building up of modern Bhutan followed by visit to local market. Time Required : 2hours 45 minutes- 3 hours. It is located on a hill which rises from the valley floor, the Gangtey Monastery is the only Nyingmapa Monastery on the west side of the Black Mountain. 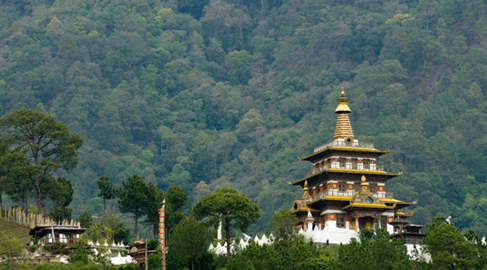 It is the biggest Nyingma monastery in Bhutan. 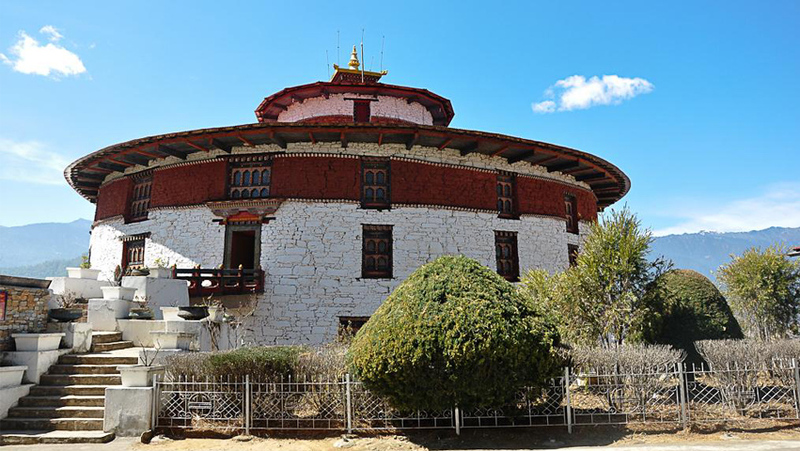 On arrival visit the Gangtey monastery which was founded by Pema Thinley, the grandson of Pema Lingp It was established in the year 1613 and the same year he became the First Gangtey Trulku(Re-incarnation). After a good lunch begin your hike down the Gangtey Monastery through the pine forests. It offers you beautiful landscape of the Phobjikha Valley. Phobjikha valley is without doubt one of the beautiful valley. The hike will take you about 2 hours to 2 and half hour. Meet your driver waiting for you at the other end of the road. You will drive from here to The Black Necked Crane Information Center. The center is well equipped with the Powerful Telescope and it has the best view for spotting birds if you are in the right time. Time required:2 hour and 30 minutes – 3 hours. Activity Level : The hike to Khamsum Yulley Namgyel is Medium. After the good morning breakfast begin you journey back to Wangdue. On arrival check in at your hotel. Later proceed for your sightseeing to Khamsum Yulley Namgyel. This particular piece of Monument was built when the current 5th King of Bhutan His Majesty Jigme Khesar Namgyel Wangchuck was crowned as the 5th King of Bhutan for the peace and prosperity of the country and for world peace. It also offers a magnificent view of Punakha valley from the top. Later have lunch at the restaurant designated by Company. Later in the afternoon visit a farm house to have a glance of how the lives of Bhutanese is lived. Interact with the people. 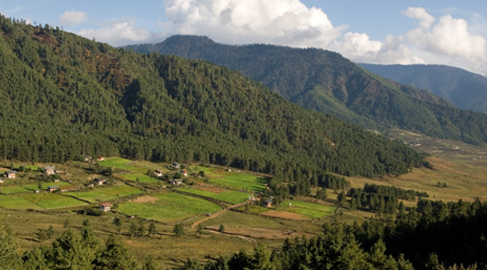 The trek to Thimphu is all the way down hill through a forested area of mostly Blue Pine. By taking leisurely pace you can reach Thimphu in about 3 hrs for a nice hot shower and lunch. Evening at leisure. Overnight at Hotel. Time required : About 3 Hrs and 30 minutes. After breakfast drive to picturesque Paro. On arrival at Paro check in at the Hotel. Later after the short rest at the hotel drive to the restaurant at town for a good lunch at a restaurant designated by company. After your lunch proceed for your sightseeing. First drive to the National Museum of Paro, once a watchtower, built to defend Rinpung Dzong during inter valley wars of the 17th century, Ta Dzong was inaugurated as Bhutan's National Museum in 1968. It holds fasinating collection of Arts,relics,religious thangka paintings and Bhutan's expuisite postage stamps and later visit the Paro Rimpung Dzong meaning the fortress on the heap of jewels or the fort of Paro. Later visit the Kichu monastery . 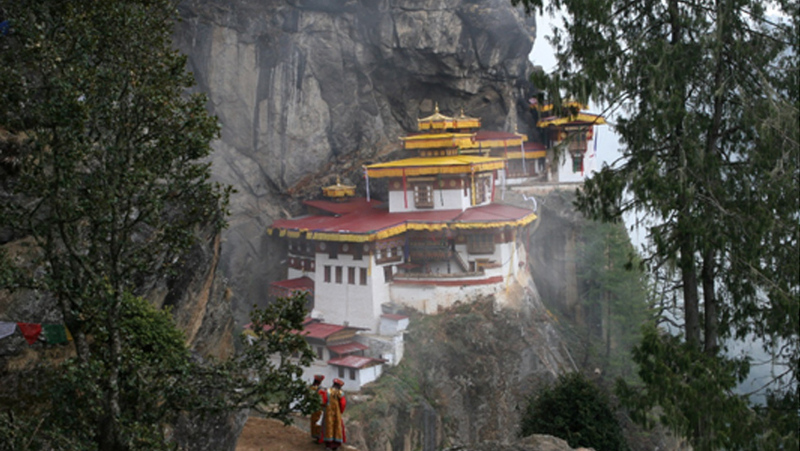 It is the most oldest and one of the first ever Buddhist monastry built in Bhutan to supress the gaint demoness. Today you will be hiking to one of the famous site called as the Tiger’s Nest ( Taktshang ) perched at 900m above the Paro valley. 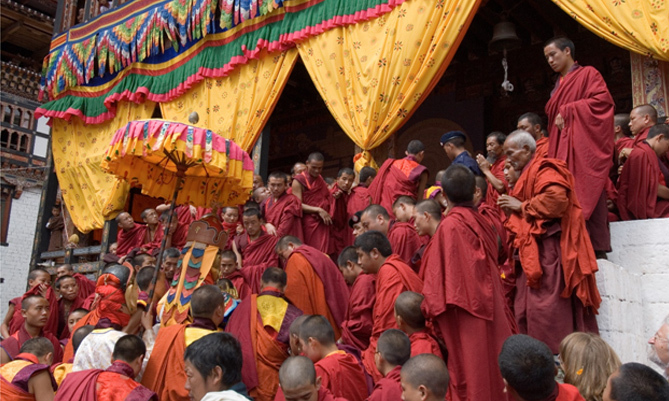 It is a pilgrimage site which the Bhutanese try to visit at least once in a lifetime. It is believed that Guru Rinpochhoe flew on the back of a tigress from eastern Bhutan to this site and meditated in a cave here for 3 months, hence its name, ‘Tiger’s Nest’ . The iste , which has long been regarded as the sacred place, was visited by Shabdrung Ngawang Namgyel in the 17th century approximately in 1646. The lhakhang of the present monastic complex dates from 1692. The main structure was severely damaged by fire in 1998, but with the help of the local people and the government it has been put back to its glory. The hike can be broken down into various stages. The first stage is the trek to the cafeteria ( where lunch will be served later today) which is situated on a rocky outcrop across a ravine from the monastery. This leg of the trek takes approximately 45 minutes to 60 minutes , depending on your level of fitness. At the Cafeteria we can stop for some tea or coffee and biscuits whilst pondering the journey ahead and looking at the monastery I the distance above us. The 2nd stage of the walk is from the cafeteria to the lookout opposite of the monastery. This leg takes close to one hour. At this point some may be content to snap photos and return to cafeteria. The next stage is the trek/climb down the 475 steps in the cliff face to the bottom of the ravine which crosses over a stream and a waterfall before the path again ascends another 300 odd steps to the entrance of the monastery. Once here we should be able to enter into the monastery and view the cave where Guru Rinpochhe meditated. ( cameras are not allowed inside the monastery).